I saw an assessment on my property tax bill. What is it for? Is there a senior exemption for an assessment on my property tax bill? There is a senior exemption for the San Rafael Public Library parcel tax. Click for the form. How do I claim exemption from hotel tax? Hotel guests claiming exemption by reason of a stay exceeding thirty (30) days shall claim exemption on a standard City form, under penalty of perjury. Transients claiming exemption by reason of employment as an officer or employee of (1) the U.S. federal government or its instruments (such as federal credit unions or the Red Cross) or (2) a foreign government exempt by express provision of federal law or international treaty shall claim exemption on a standard City form, under penalty of perjury. The officer or employee shall also provide photo identification, proof of his or her governmental employment as an officer or employee, and proof that his or her occupancy is for the official business of his or her governmental employer. Who is exempt from hotel tax? Hotel guests staying more than thirty (30) days. Officers and employees of the U.S. federal government and its instruments (including federal credit unions and the Red Cross), in the course and scope of their employment. Officers and employees of foreign governments, where exempted by express provision of federal law or international treaty. How can I print a copy of my business license? Create an account profile at https://elicense.cityofsanrafael.org/Home/SignIn. By logging into this profile, you can renew, close, or print documents from one or more linked business license accounts. A business license is a tax for doing business. 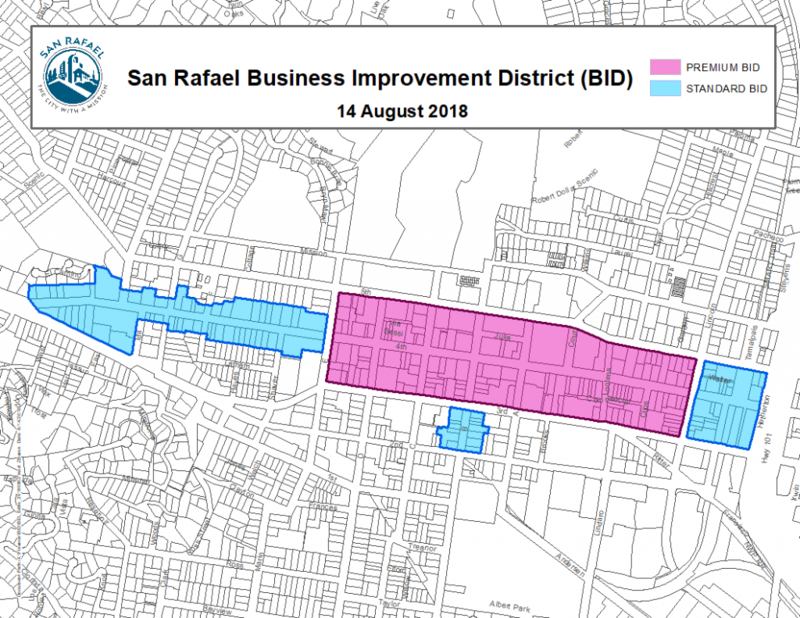 The San Rafael Municipal Code requires that you obtain a license to conduct business within the city limits of San Rafael, even if your physical office is located outside city limits. A business license is not a permit. It is not evidence that the holder is qualified to operate the business or that the business is being conducted in compliance with applicable legal requirements. Anyone who conducts business within San Rafael city limits must obtain a business license. Yes. However, the business license tax is waived upon presentation of proof that the business has a non-profit status. Yes. In addition, a home-based business must comply with City of San Rafael Zoning Standards. I just purchased an existing business. Can I use the previous owner’s license? What if I close or sell my business? Please provide written notification of a business closure or sale. Include the date the business was closed or sold and the name of the new owner, if applicable. For your convenience, you may contact us via email at BLRenewal@cityofsanrafael.org or fax us at (415) 485-3100. You can close your license online. You will need your account number and your PIN, both of which can be found at the bottom of your renewal notice or in a reminder email. What if I want to move the business/change my business address? Always check with the City’s Planning Division to verify that the new location is zoned properly for the intended use and whether a Use Permit or another type of approval is required. Please submit a new business license application for the new location. If you are registered with other government agencies such as the State Board of Equalization, you may need to update your address of record. What if a corporate officer changes? The president, treasurer, and other officers of a corporation may be shareholders, but they are not the owners of the business for our purposes. We consider the corporation itself the owner of the business. Just send us a follow-up email with updated contact information. Why isn’t there an expiration date on my business certificate? To save paper, postage, and staff time, we are no longer printing new certificates every time a license is renewed, unless there is a significant change such as a new business name or address. You can view expiration dates in the online business registry. Why did I receive a business tax certificate? “Business tax certificate” is simply a more accurate term for what is commonly referred to as a “business license.” Our Finance Department collects business tax but does not regulate businesses; therefore, we are trying to minimize the use of the term “business license,” which suggests the granting of permission. My bank/mortgage company or another government agency wants to see my business license. Third parties occasionally ask to see your business license. On the top of our main business license webpage, there is a business registry search feature that third parties can use to see if your San Rafael business license is current. How can I expedite the processing of my business license application or renewal? Register online and promptly respond to any follow-up emails. If you use a paper application completely and accurately (including your start date). If your business is located within city limits, Contact the Planning Division to get their zoning approval ahead of time. Renew online if your business is eligible. The City mails or emails renewal notices to businesses as a courtesy; however, it is your responsibility to renew your business license in a timely manner even if the renewal notice is not received. Penalties are assessed on delinquent accounts, regardless of whether you received a renewal notice. Please verify that your mailing address or email address on file is current. I mailed my Business License renewal by the due date. Why was I charged late penalties? The City received my business license renewal only a few days after February 15. Why was I charged late penalties? Annual renewals are due January 1 (unless you operate a financial institution, an insurance company, or a non-profit on a July – June renewal cycle). There is a 45-day grace period, after which penalties are assessed. If your payment was received after February 15, you were actually more than 45 days late. Commercial locations are periodically visited by Fire Inspectors for compliance with life safety regulations. This fee covers the cost of these inspections. If you have additional questions about this fee, please contact the Fire Prevention Bureau. Can I make installment payments on my balance due? Yes, we typically allow people to make payments. However, depending on the amount due and the number of installments, we may require you to sign a promissory note and to pay interest and a processing fee. Please contact the Business Tax Division at (415) 485-3051 for details. Every business must abide by the City’s zoning requirements. Before signing any lease or rental agreement, please contact the City’s Planning Division to make sure your business activity is appropriate for the area’s current zoning designation and that it will not require a public hearing or special parking considerations. Most businesses engaged in the sale of tangible goods require a California Seller’s Permit in addition to obtaining a business license. To apply, contact the State Board of Equalization. No, you can’t distribute any commercial handbill or advertising at any homes without having permission of the owner or occupant. Only certain information is available to the public – for example, business and owner names, physical and mailing addresses, and business types. This information is printed on your business license certificate. We do not disclose phone numbers, e-mail addresses, or financial information to the public, except as required by law. How do I pay my Business License? You pay your Business License Tax when you register for or renew a Business License. If you have a Business License, you have already paid your Business Tax. Business License tax registration applications are available online, or you can pay on the top floor of City Hall during the Business License Division business hours. If you would like to register your new business, you should check with our Planning Division to make sure your business location is zoned properly for the business you want to do. Then you will need to complete a Business License Application. How do I renew or close my business license? You can quickly renew your license or close it online. You will need your account number and a PIN, both of which can be found at the bottom of your renewal notice or in a reminder email. Annual renewals are due by January 1 for most businesses (July 1 for banks, insurance companies, and non-profits). If your contact preference is set as email, your renewal notice will arrive as a PDF attachment from BLRenewal@cityofsanrafael.org. Otherwise, it will arrive via regular mail. To sell alcoholic beverages, you’ll need a liquor license. California has four types (3 for full liquor and 1 for beer & wine only). You can find information about buying a liquor license from the California Department of Alcohol & Beverage Control (ABC). The nearest local ABC office is in Santa Rosa and you can call them at (707) 576-2165. Your business may also require special review and approvals from the City of San Rafael. Contact us and we’ll let you know. Temporary licenses can also be obtained for events. You’ll need to collect signatures from the property owner, Police Department and the City Manager’s office.